Saturday had been a very exhausting day for me ...many different emotions, disappointments, and things were involved. Some place along the way, I was reminded of the song, "Standing on the Promises of God." Sunday morning, even although I had a very nice long sleep...better than I'd had for a very, very long time, I was still too tired to go to the early service at Trinity. Decided to stay home and catch up on my Bible reading. I also read a bunch of my journal entries from 2005....very refreshing! On September 29, on the way home to Manitoba for a few days, I wrote many pages, to keep my emotions under control. It was very hard leaving Renee when I had been with her day and night for three months without a break.
" This is an ongoing battle. It will not be finished till we see Jesus face to face. 'God, help me not to give in to the fear and discouragement that Satan tries to get me down with. The battle belongs to you. '......They that wait upon the Lord shall renew their strength......wait means to be intertwined. 'Your arm is around me and my arm is around you. You will not let me go and I need to hang on to You and just rest in You, knowing you will not let me go. You have promised that your love is unfailing.' 'The Lord is my shepherd, I shall not want.' I have to remind myself of that again and again." That was two and a half years ago. The truth of what I wrote then has not changed. But God has brought about changes in me. Some times I hardly feel like the same person. But sometimes it feels like the change is too slow or like I will slip back to my old ways. 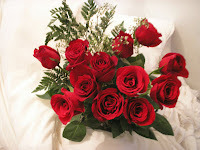 These beautiful roses were presented to me on Sunday after Ray came back from church....nice "surprise!" Belated Happy Valentine's Day! Better late than never! In the evening we all went to Redeemer Presbyterian, including Renee and Lynne. In his message, Tim Keller talked about how we need to fall on our faces before God now, so that we will be able to stand, and stay standing at the Judgment. If not, our feet will give out under us and we will fall to our knees when Jesus returns, but it will be too late. Martha... I met Renee at Beaver Creek camp - many, many summers ago. She was working as support staff, and I was counselling for the very first time. She was awesome. In fact, we kept in touch by email for years afterward, until probably 2003 or 2004 - which is why I didn't know she was sick until someone shared the horrible news about her passing with me this morning. I just want you to know that your daughter made an impact on me - just the way that she lived her life. The world needs more people like her, and I don't understand why she couldn't stay here.